Pumpkin carving and decorating is a favorite pastime during this time of year. After you've carved an amazing design or face into a pumpkin or two, you want to show it off through your window or set it out on your porch for the neighbors to see. Without knowing the tricks to save your holiday pumpkins, they can turn slimy, moldy, and mushy in as little as three days. Don't let that happen — let everyone see your original masterpiece, not a mushy, sunken, sad version. Learn these tricks now and have the best looking jack-o'-lanterns in your 'hood for Halloween and beyond! Just keep in mind that if you live in an area with high humidity and/or lots of rain, your carved pumpkins won't last as long as those in dryer environments. More information can be found at Clorox's website. It's also interesting to note that over at My Science Project, a bleach-treated jack-o'-lantern lasted for up to ten days with only minimal decay. Some people also spray their carved pumpkins with a bleach solution daily. This will also work, but your pumpkin will decay quicker this way. It won't rot as fast as an untreated pumpkin, but it won't last as long as one soaked in the bleach solution. While it may seem odd with so much airflow in a carved pumpkin, an opened packet of silica gel can really keep the rot away from your jack-o'-lantern. Mental Floss did a comparison of a few of the tricks off this list, and found that the bleach solution above and an opened silica packet were the best at prolonging the life of a carved pumpkin. 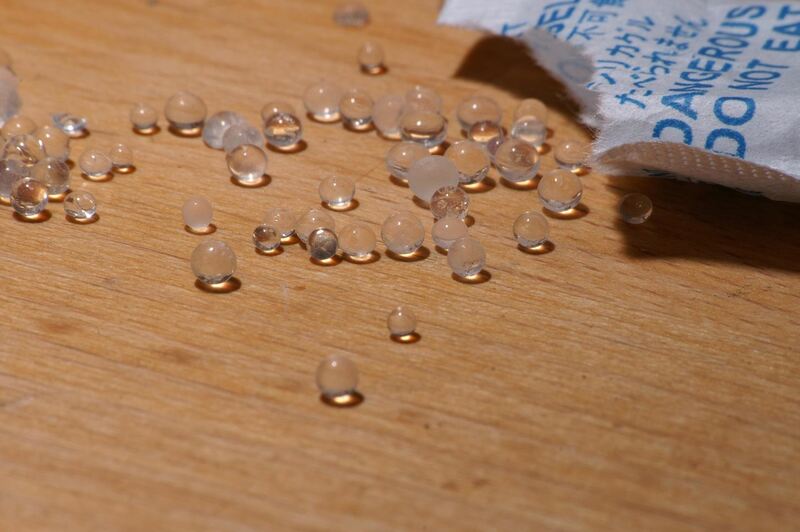 Since silica packets are a desiccant, it's no surprise they work well. They absorb moisture and keep things fairly dry if it's humid out, and a non-moist carved pumpkin means less mold growth and less drooping. This is probably the easiest solution available. Pumpkin Fresh is specifically designed to prevent mold on your pumpkin, carved or whole. You can order it online or find it at your local pumpkin patch. My Science Project describes the ingredients as containing "water, sodium tetraborate decahydrate (borax), and sodium benzoate (a preservative and fungicide). The label describes it as a 'fungicidal solution.'" This stuff isn't in a lot of stores, so you'll have to snag it from their website. 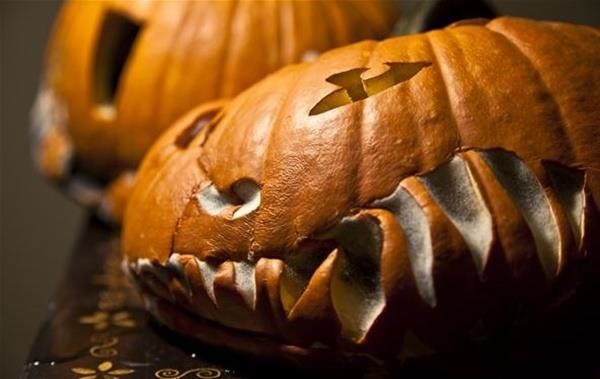 This solution is designed to keep carved pumpkins at their freshest, unlike some solutions, which preserve whole pumpkins (see last method below). Just spray it all over the interior and the cutouts and enjoy a long-lasting jack-o'-lantern. 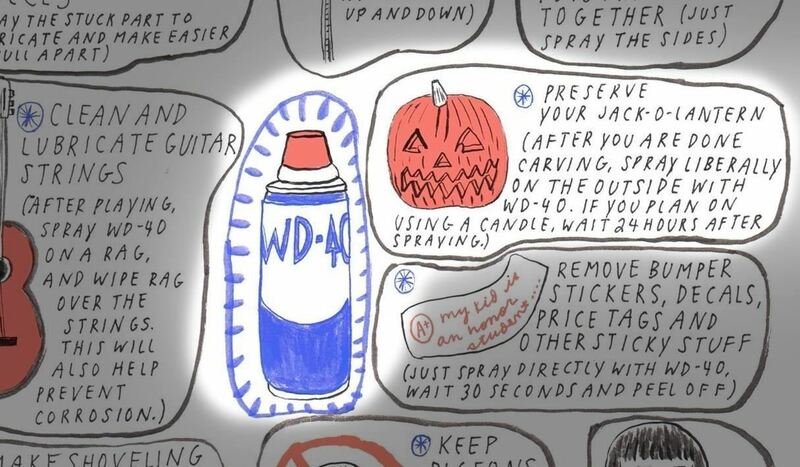 Not only is WD-40 great for your squeaky doors, turns out it's also great for pumpkin preservation. How and why does it work? The company famously keeps its ingredient list a secret. However, WIRED Magazine sent a bottle of the stuff to a lab and broke down the ingredients within. Grab some WD-40 (try Amazon or Walmart if you don't have any around the house). 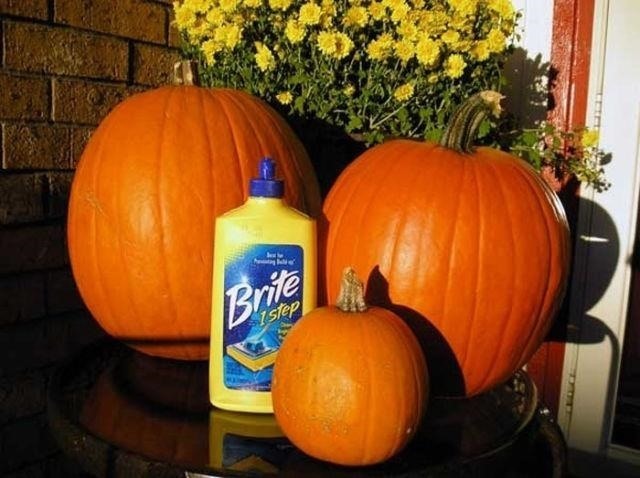 Spray all over your uncarved pumpkin to keep it looking shiny and new. For carved pumpkins, spray inside and outside making sure every part is saturated. Keep in mind that mineral oil is flammable, so you may want to be cautious about putting a lit candle inside, but some folks say they've never had to deal with a jack-o'-lantern en fuego. Also, this method, along with the next few methods, won't work as well as the bleach and silica ones above, since there is more moisture present. 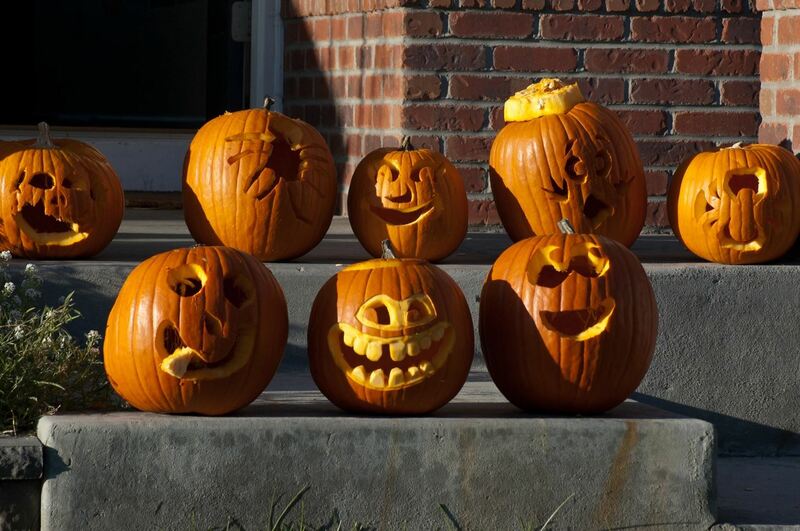 Petroleum jelly is a great way to keep your carved pumpkins from drying out and getting that wrinkly look. It's water-repellant, so it seals in the natural moisture while keeping outside moisture away. 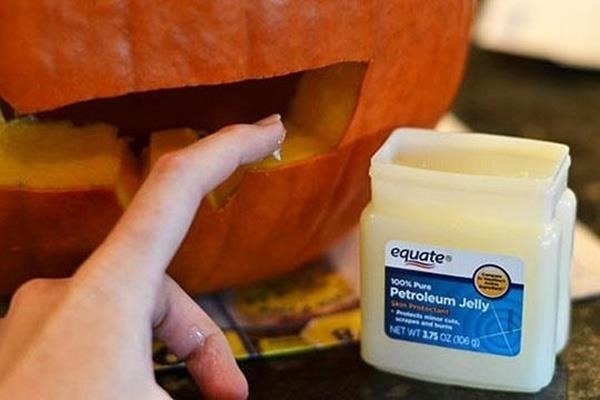 Spread the petroleum jelly inside your pumpkin and around all of the cut out areas. Extreme Pumpkins makes a good point, though: spreading petroleum jelly on a pumpkin is kind of a pain. We suggest you put on a disposable latex glove so you don't have to goop up your hand and you can really slather the stuff on with minimal mess. That goes for the method below, too. If petroleum jelly sounds unappealing to you, you can also use a vegetable oil such as olive oil to do the same thing. Most of the oils you have in your kitchen, like almond, avocado, and sesame, are occlusive agents — meaning that they hold in moisture, just like petroleum jelly. Simply apply oil all throughout the inside of your pumpkin and all of the cutouts. Reapply as necessary. As with petroleum jelly, we recommend using a disposable latex glove for application to minimize mess. Yes, floor cleaner is an excellent preservative, but for uncarved pumpkins only. This is a great trick for those of you who just like the look of whole pumpkin decor in your homes for Halloween and Thanksgiving. Floor cleaner will keep your pumpkins shiny and fresh for up to four weeks. While Hey Now Whoa Now used Brite floor cleaner, alas, that brand was discontinued in 2008. Fortunately, many brands of floor wax will still work to preserve pumpkins, as long as it's an acrylic liquid type of cleaner, at least according to the University of Nebraska at Lincoln. Just apply liquid floor cleaner to a moist towel and gently wipe all around each pumpkin, leaving a thin coat. It goes without saying that you can't eat the pumpkin once it's been treated in this fashion. 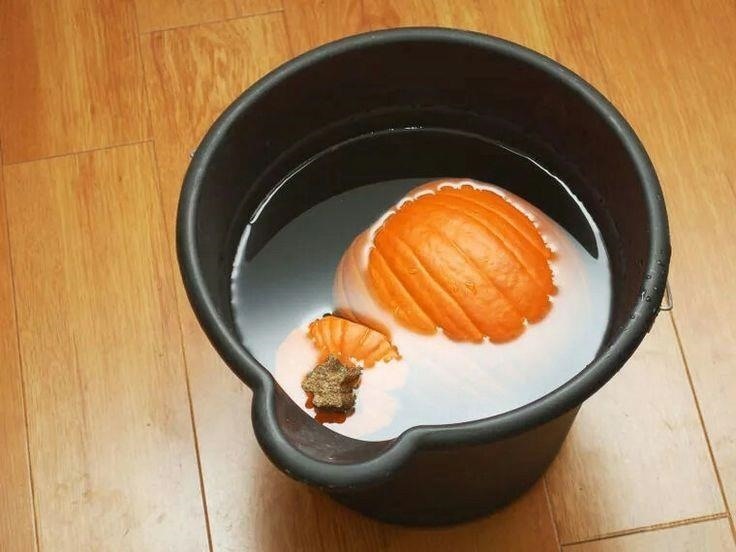 If you can't quite handle the thought of applying floor wax to a pumpkin, Stephanie Lynn has another solution: clean the pumpkin or gourd with a mild bleach solution (ten parts water to one part bleach) to kill any bacteria on the surface, then apply a little bit of petroleum jelly and buff the gourds to a high shine. You can also use plain ol' vinegar and water to rinse the surface, too, since it's food-safe and kills the majority of viruses and bacteria. Now that you have the best pumpkin preserving tricks on hand, you better get to carving! More fun Halloween food hacks await! Damn it. I could've used this guide two days ago, stupid pumpkins. ive personally tried the bleaching method before, works like a charm! just bought two very large ones today... its the only way to get them is to buy early... what should i do to ensure them lasting for 4 weeks? Don't carve them right away. Not sure any carved pumpkin can last a whole month. Maybe two weeks. I live in a very hot and humid place. I got my pumpkin yesterday, any ideas if keeping it whole will last at least till the 31st? Kids also want to paint it would I need to wash it with vinegar before painting it? And after painting it can I use WD-40? Would this work for pumpkins that have already started to get mushy? Probably not. It might slow it down a bit, but once it's started going bad, it's better to just say goodbye. If i do a bleach solution after carving the pumpkin, so how long does it last? I mean how long does it still look great? ???? After reading all these suggestions, I opted to try a liberal coating of cooking spray inside and on any exposed areas of the carved pumpkin. It should do the trick! I will post results after the season.